Coconut oil is under attack. Once hailed as a miraculous superfood, its reputation has been more than a little bruised after a Harvard professor described the substance as “pure poison”. To remove any doubt about her feelings, Karin Michels, an epidemiologist, added that coconut oil is “one of the worst things you can eat”. Pure poison? Well it won’t kill you instantly, eyes popping, foaming at the mouth, gasping for breath – nothing quite as dramatic as that. But it’s true that coconut oil could, for avid and devoted fans, contribute to potentially fatal heart disease. So how can such a natural plant product be regarded as being so dangerous? After all, it looks so innocent, with its white flesh and refreshing liquid centre providing an exotic taste of tropical beaches, as well as minor amounts of minerals (potassium and iron), some fibre and fat. It has also been a long standing and popular ingredient in sun cream and shampoo and skin products. But it is edible coconut oil that has grabbed centre stage recently for its supposed health benefits. Products containing coconut oil and recipes using it are becoming ever more popular. A quick web search will provide numerous suggestions for including more coconut oil in your diet by using it in cooking and baking and even mixing it into tea, coffee and smoothies. With claims of health benefits including weight loss, increased “good” cholesterol, improved immune function and even prevention of Alzheimer's disease, it is easy to see why the public would be swayed to swap their usual household oils and fats for this incredible sounding product. Not even the high price tag seems to deter buyers (one British supermarket is currently selling it at £1.36 per 100ml compared to vegetable (rapeseed) oil at 11p per 100ml and olive oil at 30p per 100ml). But looking more closely at these apparent health benefits, we can see that most claims derive from studies, which to date, are based on animal or in-vitro (laboratory) studies. By far the biggest negative for coconut oil is the fact that it is so very high in saturated fat. As much as 86 per cent of it is made up of the type of fat that we have been urging people to cut down on in their diets due to its proven association with raised “bad” cholesterol and heart disease. Even butter, that long standing enemy of heart health fanatics, looks healthy compared to the fatty acid profile of coconut oil, at 52 per cent saturated fat. Olive oil comes in at 14 per cent and rapeseed is 7 per cent. So why, after decades of promoting the evidence-based health benefits of replacing saturated fats with unsaturated fats, such as olive, rapeseed and sunflower oils, has this product soared in popularity? Perhaps it is the taste that people like (though I’m not convinced it’s that good). Or the fact that it seems like an exotic and trendy ingredient, and people are still unconvinced about the risks of saturated fat (despite professional advice not changing for years). Whatever the reason, timely draft reports currently being finalised from the UK’s Scientific Advisory Committee on Nutrition and the World Health Organisation continue to endorse the dietary guidelines of restricting intake of saturated fat to less than 10 per cent of total energy intake (around 20g for women and 30g for men per day). 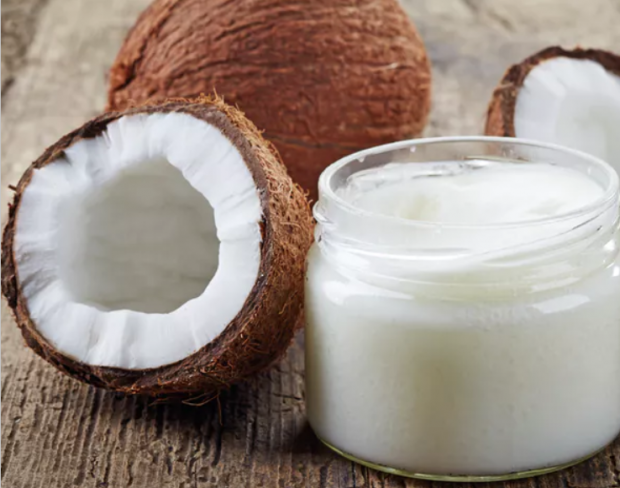 Using as little as two tablespoons of coconut oil in the daily diet will smash this target to pieces, providing 26g of saturated fat as well as around 200 calories. Do I use coconut oil in my kitchen? Definitely not. But the odd can of (reduced fat) coconut milk for a Thai curry or bag of desiccated coconut for home baking can be found lurking in my larder. No single food is a “superfood”. It is the overall balance of our intake that matters. As with any high fat product, coconut oil should be used sparingly, only occasionally and as a minor ingredient, rather than as a replacement for staple oils such as rapeseed, olive and sunflower oils. Coconut oil is not strictly speaking a poison – but nor is it something which should pass our lips without caution.